None of the Crew could make it over to Nexus for round one of the 2012 IPA Challenge on Sunday (I know, I know, bad beer bloggers putting work/life ahead of beer). Half Pint is pleased that Il Vicino is tied for first after the opening round of the IPA Challenge. But thankfully the good folks at the New Mexico Brewers Guild posted the results on Facebook when all the votes were tallied. 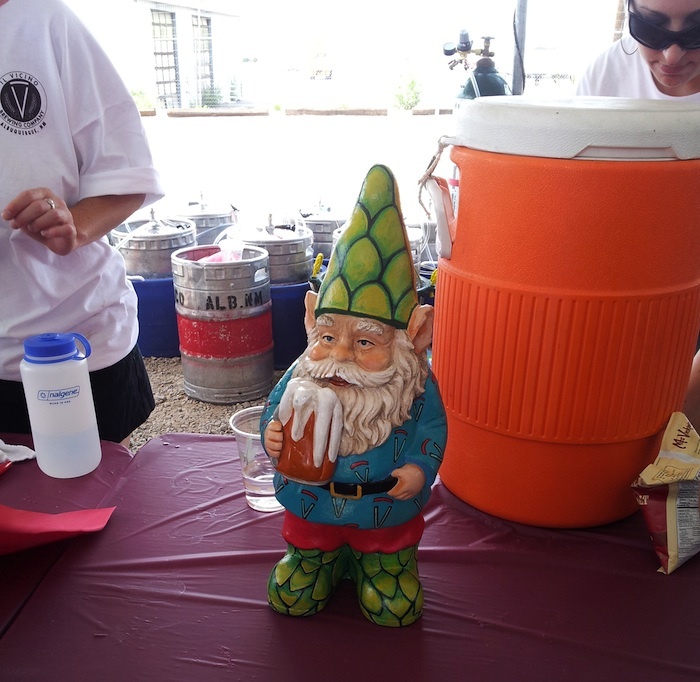 A total of 14 breweries participated, with the most notable absentees including Sierra Blanca/Rio Grande, Eske’s, plus newbies Broken Bottle and Taos Ale House, and as-yet-unopened Boar’s Nest. Anyway, of the 14 who did participate, two stood out above the rest. In the listing below we go by ranking, with the number in parentheses representing the number that the brewery was give in the blind taste test. Those numbers will not be the same for the next three legs of the Challenge. Il Vicino is the three-time defending champion and will play host to the final round (which the Crew will attend, we already have our tickets) on Saturday at noon. If there is a surprise, it is award-winning La Cumbre only coming in fifth, but there are a lot of votes still to be tallied at the next three venues, so this battle for the coveted silver trophy is far from over. And if anyone out there is attending either Tuesday’s event in Farmington or Thursday’s in Santa Fe, and you feel like sharing your experience, just contact us on our Facebook page or via the comment section below! The IPA Challenge is one of the biggest events (after ABQ Beer Week) in the New Mexico craft beer scene. Four rounds of tastings are spread out between three towns that showcase each brewery’s best India Pale Ale. This year’s IPAC starts July 22 at Nexus, followed by rounds at Three Rivers in Farmington on July 24, Second Street in Santa Fe on July 26, and the grand finale at Il Vicino Canteen on July 28. Turtle Mountain’s entry for the IPA challenge is nearly ready. Now, I have to admit that I’m not an IPA fan, but even for me there are ways to make this event a little more enjoyable if you keep an open mind. The competition is a blind taste test. You pay, you receive a judging card and a tray with 16 samples (or however many breweries submitted), you find a place and taste what NM has to offer. This event fills up fast! And with the first challenge being at Nexus, get there as early as possible to avoid a battle for the limited parking … or better yet, ride your bike! You’re doing a taste test of 16 different beers, no two are alike and flavors will vary. Water is good to cleanse the pallet. Embrace the hops! I learned this last year at September Fest at Marble, pretzles are your best friends at these types of events. They are filling and will keep you from getting too buzzed. Plus a change of flavor will help you get through the challenge. We did the math last night, the challenge itself is roughly three pints of beer (or at least it was last year) plus the pint of your number one pick. The card is good for notes; write down what you like and don’t like. Keep it simple. Like any event, have fun. Talk to people and talk to the brewers! They love beer just as much as you do. Those are my tips for the challenge. Also, like anything involving drinking in a public fourm, don’t be an jerk and don’t drink and drive afterward!